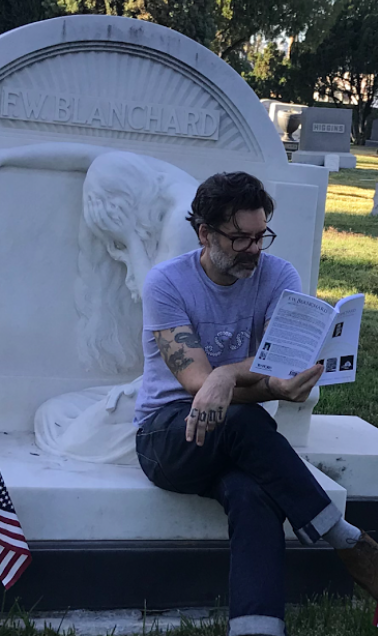 I spent part of my Saturday reading a book about Frederick Woodward Blanchard ...while sitting at his graveside...on the ledge of a stone monument designed by Lloyd Wright. There are worse ways to spend an afternoon. Blanchard, for those of you wondering, was among the most prominent residents of fin-de-siècle Los Angeles. He was instrumental in the development and expansion of the arts in L.A., the city's unique street lighting system, and other essential aspects of L.A.'s infrastructure. Perhaps his most important position was as the first president of the Hollywood Bowl, the iconic outdoor auditorium. I wrote recently about using cemeteries as teaching tools - as starting places of historical inquiry. Soon I will be asking my students to try and unravel some of the mysteries of early Los Angeles, by starting with a few of its most prominent, but relatively unknown citizens. What the most diligent will find is that there is a mountain of information available: local histories in both print and virtual formats. Books, articles, blogs, and old movies exist around every archival corner - some hiding in plain sight...some a bit more challenging to unearth. But it's out there...lots of it. And introducing them in the classroom will open doors to the past that my students probably did not know existed. As I did a little preliminary research in advance (I am not a fan of surprises...and you ever know what you'll find down the rabbit hole), I was reminded of how much I love local histories. I've collected great ones over the years, but most are studies of little burgs in the East - usually near (or on) some Civil War battlefield or another. More often than not, these books and articles and movies are authored or produced by non-professionals. As such they generally do not read like academic monographs (this is sometimes a good thing, friends) and do not necessarily adhere to the rigors of academic research. So, of course, one might challenge a conclusion here and there...and there might be a few, um, mistakes. But I love them all the same. Hey...if you think about it, how is this any different from academia? I mean, who among us has not sinned? Local histories tend to offer something different: a level of authentic enthusiasm that does not always shine through in traditional historical study. They ask questions professional historians might not consider about genealogy, material and visual culture, or even how a community smelled and sounded. They are often written by locals or the descendants of their subjects, and thus have a personal connection that adds to the charm of the work. Finally, and to their credit, these works are so very accessible. Never once have I been bogged down by unnecessarily dense writing and esoteric language. I think the pros have a thing or two to learn. By the way...the book I'm talking about is F. W. Blanchard: First President of the Hollywood Bowl by Beverly Blanchard Nelson and Pamela T. Lundquist. Do you have a favorite local history? Let me know in the comments.